How Does Your Blog Look to Someone on Google? 6 Things You Need to Know. We’ve all spent time thinking about our blog’s SEO. And we’ve all spent time thinking about on-site conversions and how well our blog performs once visitors arrive on our pages. 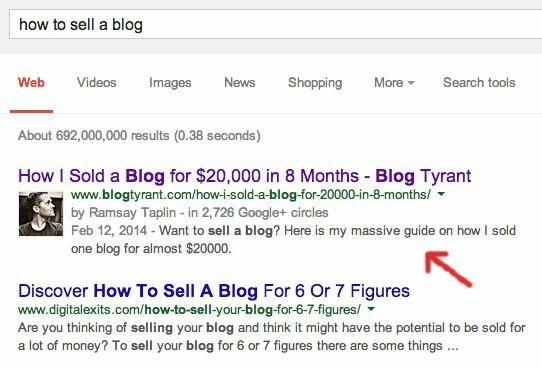 But how much time have you spent thinking about how Google actually displays your blog in their search results? It’s actually a really important thing to consider – and it will affect your conversions in a really big way. Okay, everyone knows that you can change the way your blog looks. You can change your colors, headers and even switch up your entire theme. This can help increase conversions and readership by keeping people focused on your content, landing pages and directing them towards a sale or opt-in form. But did you know that you can also change the way you look on Google? 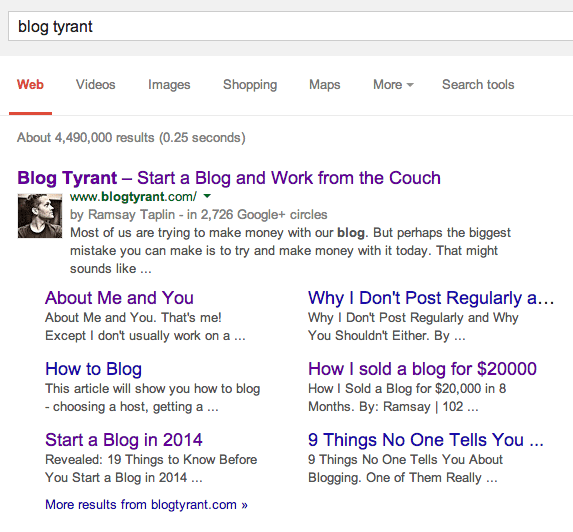 Here is a screenshot of what you see if you type “Blog Tyrant” into Google. This is the most basic example of how a website looks to Google. But what about a search term that returns a single post result? Here is the result for the search terms “blogging seo” where I rank number one after a few ads. You can see that the title is cut off because it is too long. 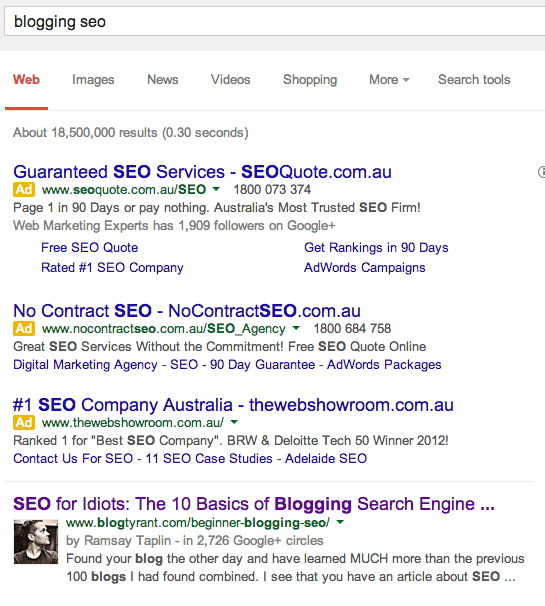 The thing you have to remember is that the way your blog appears in Google is just like an advert. Those search results are the first interaction people have with your blog and it’s vital that you craft them as best as you can to ensure people click through and then stay on your site. So what do we need to look out for specifically? Please note at this point that I’m not talking about improving your ranking factors. This is not about getting higher up in the SERPs. If you want to do that you can read my posts on SEO secrets and blogging SEO. This is specifically about how you appear in Google – the visual and textual elements that are shown to Google’s traffic. The title is the most important part of your appearance in Google. It is what people see first and what they scan when they are trying to determine what link to click. The title that you write on your blog (i.e. 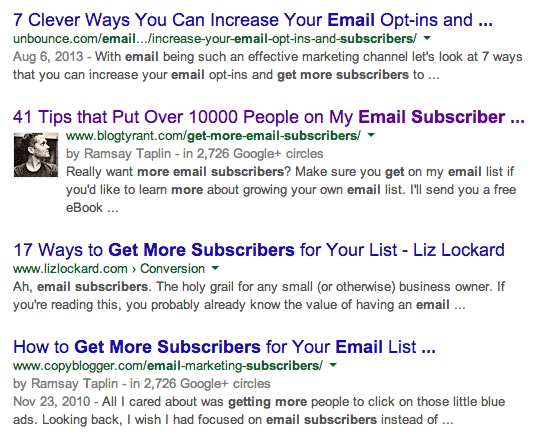 the title of each blog post) is not always the best title for your Google results. It sounds confusing but there are many reasons why this might be the case. One way to think about it is that the goal of your Google titles is to get people to click, whereas the goal of your blog post titles is to get people to read the article. And that means it’s sometimes necessary to re-write your titles for search engines. If you’re on WordPress (and you should be!) plugins like All in One SEO Pack and Yoast’s SEO will let you re-write your titles in a flash. Here’s a screenshot of how AIOSEOP give you an extra column in your Posts are to re-write titles. I’ve done this one because the original title that I published on my blog was too long for the Google results and I got a fair chunk cut off. The next thing that we need to be aware of is the fact that different search terms have different title lengths in Google thanks to a new re-design. In the old days you’d know that Google would basically display 70 or 71 characters for your title and so you’d know pretty much what was going to get shown and what was going to get snipped. You now need to think about how much of your title is going to be made bold by Google, how much is going to be in CAPS, and so on. Lucky for us there is a great tool over on Moz that can show you how your titles will look for the particular search query that you are going after. It won’t always be necessary but it’s a good thing to be aware of. If you’re not sure, Google Authorship is the neat little trick that allows you to link your Google+ account with your blog (or blogs) and get a little photo appear next to your name in the search results. The above screenshot is for the search phrase “get more email subscribers” and as you can see mine is the only one with an authorship photo. I actually have two results there on two different sites and interestingly Google will only show my photo once. The main takeaway here, however, is that having your photo in the SERPs can have a big effect on click through rates – especially if none of your competitors have their set up. I should note at this point that not everyone is a fan of Authorship. Some people assert that it decreases traffic, especially when the listing is for an impersonal result like a shop, product or service. Some people also say it looks too much like an advert. Description tags stopped having a rankings benefit a long time ago but that doesn’t mean we should ignore them. The annoying thing about descriptions (the little bit of text under the title) is that, if left to its own devices, Google often creates its own text based on the information it find on your website. 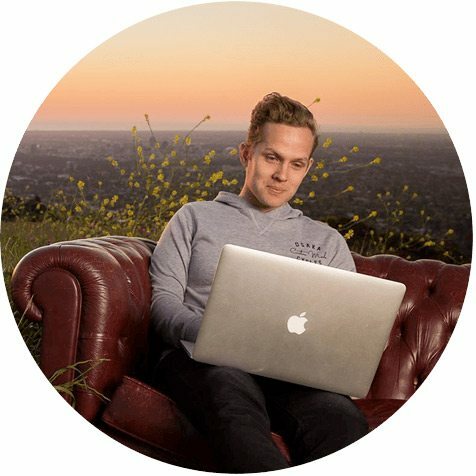 A much better option is to use a plugin like AIOSEO to re-write those descriptions using all of the brilliant things you know about compelling copywriting. Remember, this is like a little subheading in an advert that Google shows to get people to click your link. In the above example you’ll see that I’m using a shorter description. This is something I’m trialling to see whether it helps my result stand out from the rest. Again, this is about testing. Marcus Sheridan has a fantastic post about how to write descriptions which goes into a lot more detail than I could be bothered with. The next thing we need to remember is that click throughs from Google are only useful if the article matches the “pitch” that you set up in your listing. For example, in the screenshot above you’ll see the listing for my article on how to start a wordpress blog. This promoted is a step by step guide that new bloggers can follow along in an orderly fashion and get it done. If, however, they click that link and find a post that compares different hosting options, or doesn’t have any visible steps to follow, you’re going to get a lot of people bouncing from that article to look for something else. It’s important that the copy that you use matches the terms that you are ranking for. Make sure you think very carefully about the message you are creating in the SERPs and how closely it matches the intentions of your target audience. Five years ago it was just blog posts that we worried about getting indexed on Google. The majority of traffic was aimed at and best suited towards the written word. These days things have changed. Google now indexes a variety of formats and shows these directly in their results page without the user having to click to a separate page like Images, Maps or Video. 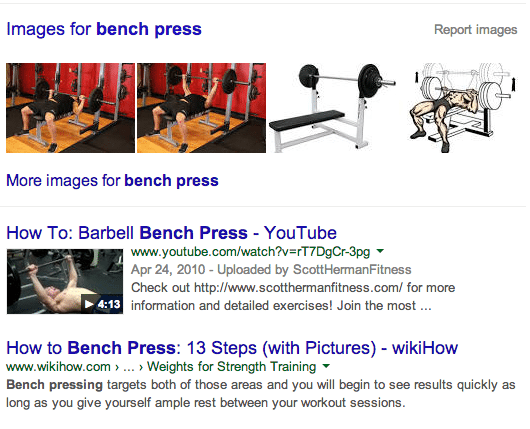 The example above shows the results for the search term “bench press” where you can see that Google has a mixture of formats (images, articles, videos) and also types of results (people wanting to buy a bench press versus people wanting to learn the bench press). These are all considerations you need to make when developing your content and going after certain target keywords. Last month I also wrote about long form content and how it impacts bloggers. We now even see this appearing within its own section on Google. 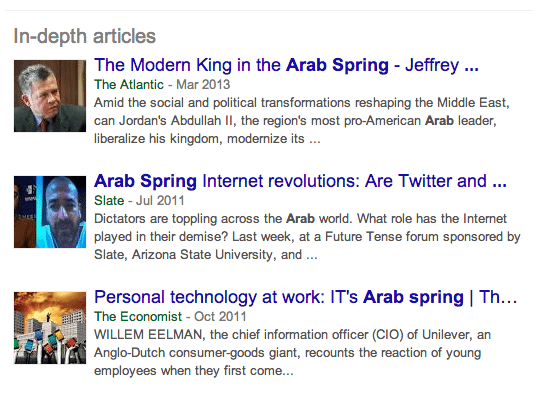 I typed in the term “arab spring” and got a huge mix of news, images, webpages and then down the bottom we have Google’s new In Depth section which showcases longer articles. These are set up with a Schema which you can read more about here. I’d be interested to hear if any Tyrant Troops have thought about this before, or if you have had any bag experiences with the way your blog appears in Google’s search results. Please leave a comment if you have any stories to share or questions to ask. Great reminders on some SEO basics. Thanks! Today I unexpectedly met with a national distributor of appliance parts (I know, real exciting, eh?) and had the opportunity to show him one of my SEO successes — one where Google, itself, is the only website that beats my website for a relatively common [competitive] keyword. The cool part is that he took me to task and wanted to see for himself that my claim was true. So he pulled out his smartphone and entered a search of my fabled keyword… turns out his phone’s default search engine was Bing, rather than Google. And because I have my ducks in a row, my stuff in order, my corners folded tightly… my website came out #3 on the first page of Bing, too. All because of title tags, description and keyword considerations you’ve mentioned here, Ramsay. This stuff really does work for SEO. Good food for thought, Ramsey! I have always been cautious about the length of my page titles but I admit – I don’t pay that much attention to it (e.g. I never go to Moz to check how my post would look like in serps ). I saw you referred several times to AIOSEO plugin – do you use it over Yoast SEO plugin? If yes – why do you prefer it? I use AIOSEO on this blog but mainly because I’m lazy. Yoast is a better plugin for the most part and I use it on other sites. Sometimes I wonder if it has too many features. Seems like it adds a lot of work. All of the above tips are very helpful for increasing CTR. I always check ‘Search Queries’ on Google webmaster tools to know the Impressions and CTR of my results. Whenever I find that there is low CTR, I consider changing the Title and Meta Description of the post. And it actually works GREAT. It does increase my CTR. Now I am going to implement ‘shorter meta description’. Let’s see it works for me or not. Yeah that is such a good tip Istiak. I really should have mentioned it. Loved the practical tips as usual mate. I had a ‘I listen to Ramsay’ moment when I thought ‘I think I did a lot of this after Ramsay wrote that great post on Google Authorship’. I remember at the time I followed your instructions and now my pic and my tag line [recently completely revamped] come up when I type in ‘Life Dreaming’. The other side thing is that all the content I’ve been sharing across FB, Twitter, Linked In, You Tube and Pinterest means that when someone googles my name I take up all of the 1st and most of the second page. I use Yoast Seo plug in and have been taking real care with my titles and the meta description I write for each post. For once, I feel like I have my ducks in a row – bloody miracle! Hope your week is going well Ramsay – nice new pic of you by the way. My top SEO tip is all about the images! I have a relatively image heavy blog anyway, but the key tip is to make sure to rename each image to something SEO friendly. And at least one image should be renamed after your keyword or phrase. There are two benefits to this. First, you rank highly in Google Image search. And second, if you’re encouraging readers to pin your images to Pinterest (which you should, Pinterest is my second highest source of traffic after Google) the description box will automatically load the name of the image. I’m just starting to try out video so I’m interested to see how that impacts my blog. Great post as usual, thanks Ramsay! Awesome! Please let us know how it goes. Really solid advice Ramsay. I am very interested in all matters ‘SEO’ because I offer this as one of my services, but coming from an experienced blogger such as yourself the specifics ring very true. Internet users are influenced more by appearances than a lot would care to admit, therefore the way your blog appears in the search is going to be a big factor-because of the sheer volume of sites out there, every little advantage is going to pay off. Just as an interesting SEO spin, I use small videos to aid in ranking for search terms also (YouTube) linked to the blog’s URL. Excellent stuff Ramsay! Videos seem like they rank a lot easier than content. I’ve had one get to 300k views above a lot of content with better links. Is that your experience? This post was a great reminder for me to think about how my blog looks offsite. I tend to forget about how google may display a site and the difference it can make on click throughs. I think having a title optimised for google and for the reader is one of the most effective and easy to do strategies that will give you powerful results. Thanks Paul. Let me know how you go and what you find. Wow that’s what you get when you try to type on the phone. Do you know anyone that uses alternate titles and meta descriptions to great effect? Anyone who has a post ranking for a top term. Trust me. Add schema marl-up if your site content warrants it. For example, a site with recipes, concert dates, movie reviews, anything that could be useful for Google’s Knowledge Graph results. Hey Ramsay, thanks for the info,I have always been wonder about the title length and description tags. Timely post Ramsey. Tomorrow I’ll be moving to a self hosted WordPress website. I’m nervous (what don’t I know that I should?) and excited (real world digital where I’m in charge). From the comments it appears that the Yoast seo plugin would be best for me. I’m not all that techy – but I’m learning. I’ll be sure and click on your link above. Good luck with the migration. Make sure you think about your permalinks. Along with the titles, we should give importance to each sentence in the article. Great food for thought in this one. I already use Yoast SEO and find it so easy and helpful for a non-programmer type like me. 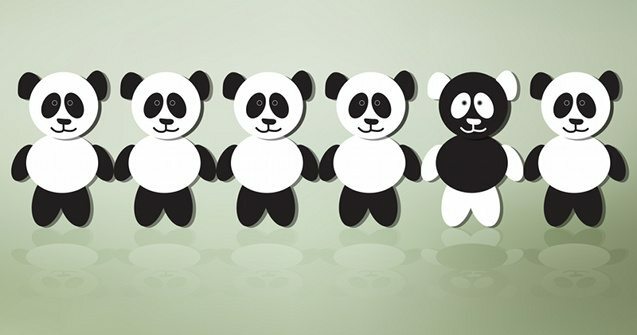 It takes the mystery out of seo which is great! The only problem I have is with authorship–I established it long ago and my picture still isn’t coming up with the search terms ‘stephanie martel’or ‘vibrant living project’. Have you heard of others experiencing this too? If so, how do they correct it? I was curious about this as well, so I went ahead and looked into it. Your author image did appear in the index when I Googled “Art in Progress follow your heart”, but I understand this isn’t always the case. Thanks for your response! Ramsay’s video is actually how I set up my authorship 🙂 but I understand that the Google algorithms are tricky. I’m going to keep exploring and see if I can get it to show up at least for my name. Maybe I need to add a meta tag to my header? I’m sure there’s a few things I’m missing. Thanks for the feedback though, much appreciated. Great article Also Nice log. I learned Many thing about SEO from This Post. Thanks for Sharing with us. Great post! Google showing your face next to your articles is great to get more traffic from their search engine. Re-writing descriptions is very important. Yes I have thought about how my blog looks like on Google and its exactly why I got the authorship thing because I personally tend to click on posts that have photos on them. I just did this a couple of days back so I’m yet to see the effect it has. Hmmh, very interesting the “in-depth article” section. Great Article. I Really Enjoyed This Valuable Post as a Blogger. Thanks a Lot for Sharing with us. Keep up it. As a blogger this post is very helpful. Thanks for taking time and sharing it with us. Hi Ramsay, thank you for this fab post, I already see my last 5 posts could be tweaked to come up better in Google. I have a question – is there anything I can do to get my blog to appear indexed as yours does when you enter ‘blog tyrant’ into Google?